The original Corralejo surf hostel located very centrally in Corralejo with a surf school transporting guests to the closest and most spectacular breaks in the Canaries. Corralejo was a small fishing village on the northen tip of Fuerteventura however it is now a vibrant and bustling tourist resort. The area provides spectacular scenery with desert landscapes and long stretches of pristine white sandy beaches.... it is an all year round destination and great winter sun destination offering famous surf possibilities just a 4 hour flight from Europe. there are plenty of alternative water sports to try as well as surfing or indeed a trip over to Lanzarote. 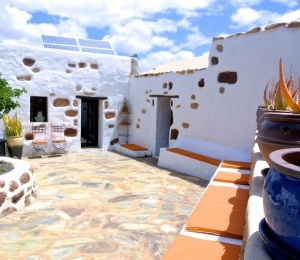 The original Corralejo hostel, this surf camp is located right in the centre of Corralejo so is perfect for shopping, restaurants and all amenities. This typical local style house has various bedroom types from dorms to twin rooms.. all are mixed and shared but single options are available on request. 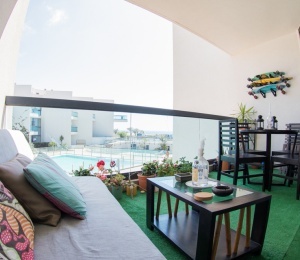 The house has 2 fully fitted kitchens for guest use, 4 bathrooms, living room and roof top terrace. A BBQ is available. Bed linen, towel, FREE wifi and breakfast is included. It is great all year round for both beginner and intermediate surfers and groups or solo travellers. 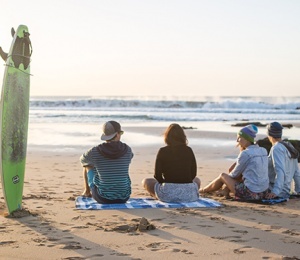 There are spots within walking distance or you can join our surf school for transport to breaks. Fuerteventura is often called the Hawaii of Europe and in the last decade has become a must visit destination for surfers from all over the world. With the mild all year round climate and many surf breaks to choose from this makes Corralejo a great detsination to learn to surf. Our surf school is mobile transporting guests to the best break on the day. Big swell season is from Oct to March however there is swell all year round... the summer tends to bring more wind great for kitesurfing and windsurfing and october is the glassiest, warmest time to come for surfers. SURFINN © 19-04-2019 06:51:24. ALL RIGHTS RESERVED.